Karl Hubbuch (21 November 1891 – 26 December 1979) was a German painter, printmaker, and draftsman associated with the New Objectivity. Hubbuch was born in Karlsruhe and baptised in the Roman Catholic church. From 1908 to 1912, he studied art at the Karlsruhe Academy, where he formed friendships with fellow students Georg Scholz and Rudolf Schlichter. He continued his studies with Emil Orlik at the Berlin Museum of Arts and Crafts School until the First World War. From 1914 to 1918 he served in the military, where he contracted malaria. He spent the period after the war recuperating before resuming his studies in a master class at the Karlsruhe Academy. In 1924, Hubbuch was given a position as an assistant lithography instructor at the Karlsruhe Academy. He became the head of the drawing department the following year, and in 1928 he was appointed professor. 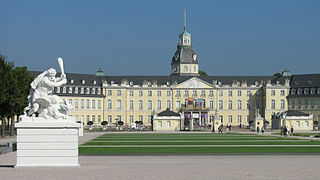 Karlsruhe is the second-largest city of the German federal state of Baden-Württemberg after its capital of Stuttgart, and its 309,999 (2016) inhabitants make it the 21st largest city of Germany. On the right bank of the Rhine, the city lies near the French-German border, between the Mannheim/Ludwigshafen conurbation to the north, and the Strasbourg/Kehl conurbation to the south. It is the largest city of Baden, a region named after Hohenbaden Castle in the city of Baden-Baden. Karlsruhe is also the largest city in the South Franconian dialect area, the only other larger city in that area being Heilbronn. The city is the seat of the Federal Constitutional Court (Bundesverfassungsgericht), as well as of the Federal Court of Justice (Bundesgerichtshof) and the Public Prosecutor General of the Federal Court of Justice. Georg Scholz was a German realist painter. Rudolf Schlichter was a German artist and one of the most important representatives of the Neue Sachlichkeit movement. During this period, Hubbuch was much more active as a draftsman than as a painter. His drawings and prints of the early 1920s, sharply realistic in style, are highly critical of the social and economic order. A trip to Berlin in 1922—during which he met George Grosz—inspired the creation of several drawings in which Hubbuch depicted himself as an observer who reacts to the urban dynamism surrounding him. He exhibited several drawings and prints, as well as his oil painting, The Classroom, in the seminal "Neue Sachlichkeit' ("New Objectivity") exhibition at the Kunsthalle in Mannheim in 1925. George Grosz was a German artist known especially for his caricatural drawings and paintings of Berlin life in the 1920s. He was a prominent member of the Berlin Dada and New Objectivity group during the Weimar Republic. He immigrated to the United States in 1933, and became a naturalized citizen in 1938. Abandoning the style and subject matter of his earlier work, he exhibited regularly and taught for many years at the Art Students League of New York. In 1959 he returned to Berlin where he died. Mannheim is a city in the southwestern part of Germany, the third-largest in the German state of Baden-Württemberg after Stuttgart and Karlsruhe with a 2015 population of approximately 305,000 inhabitants. The city is at the centre of the larger densely populated Rhine-Neckar Metropolitan Region which has a population of 2,400,000 and is Germany's eighth-largest metropolitan region. On 4 January 1928 he married Hilde (née Isay; 1905–1971) in Trier, where she was born and raised, and who had studied photography at the Bauhaus. Her likeness is recognizable in many of Hubbuch's works of the 1920s, such as Zweimal Hilde ("Hilde Twice"), painted in 1923. Hubbuch published collections of satirical drawings, and in 1930 he collaborated with Erwin Spuler and Anton Weber in publishing the critical and satirical magazine "Zakpo". As a known antifascist, Hubbuch was dismissed in 1933 from his teaching position and forbidden to paint by the Nazi authorities. Having an affair before, Hubbuch got divorced in 1933, and Hilde, being Jewish, emigrated in the same year to Vienna (till 1938) and on via London to New York, where, varying the name to Hubbuck, she made a career as a photographer. In 1940 he married Ellen Heid (née Adam-Falk), who had her daughter Myriam (b. 1932) before they met. Until 1945 he supported himself with commercial jobs which included decorating ceramics and painting clock faces. Zakpo: Monatsschrift für Zeitkunst, Zeitbetrachtung, Satire und Karikatur was an artists' magazine published in 1930 in Karlsruhe, Germany, by the actor Hermann Brand and the artists Karl Hubbuch, Erwin Spuler and Anton Weber who had been art students at Badischen Landeskunstschule in Karlsruhe. Two issues were published, in May and June 1930. After the war he was able to resume his post as a professor of painting at the Karlsruhe Academy of Fine Arts, where he would teach until 1957. He worked in relative obscurity during this later period, painting and drawing in a style close to expressionism. In the 1960s the revival of interest in figurative art brought new attention to his work, along with a reevaluation of the artists of the New Objectivity in general. Because of failing eyesight he produced few works after 1970. Karl Hubbuch died in 1979 in Karlsruhe, where approximately 100 of his works are now housed in Gochsheim Castle. Gochsheim Castle is an old royal residence in the Kraichtal area of Baden-Württemberg, in the north-eastern part of Karlsruhe, Germany. It currently houses a museum and holds around 100 works of local artist Karl Hubbuch who died in 1979. In 1985 Ellen Hubbuch donated about 100 pieces of his work to the municipality of Kraichtal, shown in Gochsheim Castle, since Karl Hubbuch's parents originated from Neuenbürg, a locality of Kraichtal. His stepdauther Myriam Hubbuch chairs the foundation "Karl-Hubbuch-Stiftung" promoting presentations and research in Karl Hubbuch's œuvre. Wilhelm Heinrich Otto Dix was a German painter and printmaker, noted for his ruthless and harshly realistic depictions of German society during the Weimar Republic and the brutality of war. Along with George Grosz, he is widely considered one of the most important artists of the Neue Sachlichkeit. 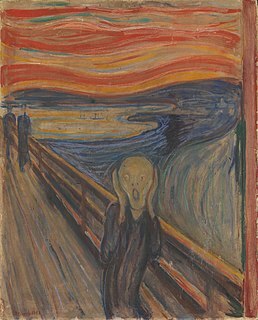 Post-expressionism is a term coined by the German art critic Franz Roh to describe a variety of movements in the post-war art world which were influenced by expressionism but defined themselves through rejecting its aesthetic. Roh first used the term in an essay in 1925, "Magic Realism: Post-Expressionism", to contrast to Gustav Friedrich Hartlaub's "New Objectivity", which more narrowly characterized these developments within German art. Though Roh saw "post-expressionism" and "magic realism" as synonymous, later critics characterized distinctions between magic realism and other artists initially identified by Hartlaub and have also pointed out other artists in Europe who had different stylistic tendencies but were working within the same trend. Christian Schad was a German painter associated with Dada and the New Objectivity movement. Considered as a group, Schad's portraits form an extraordinary record of life in Vienna and Berlin in the years following World War I.
Georg Schrimpf was a German painter and graphic artist. Along with Otto Dix, George Grosz and Christian Schad, Schrimpf is broadly acknowledged as a main representative of the art trend Neue Sachlichkeit, which developed, in Weimar Germany, in the 1920s as a counter-movement to Expressionism and Abstraction. Schrimpf was listed as a producer of Degenerate Art by the German National Socialist government in the 1930s. Albert Renger-Patzsch was a German photographer associated with the New Objectivity. Anton Räderscheidt was a German painter who was a leading figure of the New Objectivity. Alexander Kanoldt was a German magic realist painter and one of the artists of the New Objectivity. Heinrich Maria Davringhausen was a German painter associated with the New Objectivity. Heinrich Hoerle was a German constructivist artist of the New Objectivity movement. Conrad Felixmüller was a German expressionist painter and printmaker. Born in Dresden as Conrad Felix Müller, he chose Felixmüller as his nom d'artiste. Carl Grossberg, originally Georg Carl Wilhelm Grandmontagne (1894–1940) was a German painter associated with the New Objectivity movement; best-known for his urban and industrial scenes. Johanna Ey was an art dealer in Germany during the 1920s. She became known as Mutter Ey for the nurturing support she provided to her artists, who included Max Ernst and Otto Dix. Karl Völker was a German architect and painter associated with the New Objectivity movement.